900 million Facebook Messenger users can now opt-in to end-to-end encryption for their conversations, with the tech giant dubbing the program "Secret Conversations." 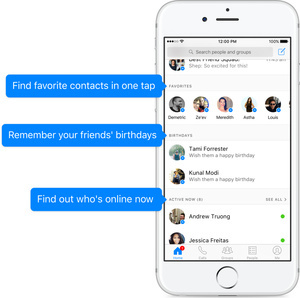 Adds Facebook: "Your messages are already secure, but Secret Conversations are encrypted from one device to another," meaning nobody can read them except the people talking, not even Facebook. To use, when you select "New Message" you will see a "Secret" option on the top right-hand side. In addition to the encryption, you can also set expiration times for the messages (from 5 seconds to one day) if you want to send more sensitive information than usual. Secret Conversations uses Signal for encryption, the highly-regarded system that is also used in Google's Allo messenger. You trust Facebook, friends of the NSA, King of Spying, All Your Data Are Belong to Us with the encryption keys or not to store the data on their end?!!!!!!!! Big deal, your ISP can't read your messages, or a casual snooper at McDonald's can't read your messages. The NSA tap at the ISP will hoover up the data and Facebook will gladly hand them the keys. To say nothing of Facebook gobbling up the data too.